I love living on the Western Kansas High Plains! Living here is so inspiring. The strength of character, resourcefullness and just plain moxie it took to come here and set up housekeeping back in the 1880s is just amazing! Imagine being 16 or 18 years old, packing up all your belongings and heading for the Great Plains homestead with your new husband, knowing you might never see your family again. Remember, these were the days before telephone and Facebook. Awhile back I happened on a tattered pioneer quilt at a local yard sale. It was being used in the back of a pickup truck to give the farm dog a soft place to lay on trips to town. What a treasure! It was a scrap quilt that had been lovingly pieced in the crazy quilt style out of tiny still-good remnants. Quilts made by pioneer women were working quilts, and this particular quilt had paid its dues. I purchased this quilt right out of the pickup truck for a dollar, took it home, washed it in my washing machine and dried it in my dryer - Can you imagine?!? It came out beautiful, though still tattered, ready to keep working. I want to be like that quilt - resourceful and giving, no matter my age or circumstance. 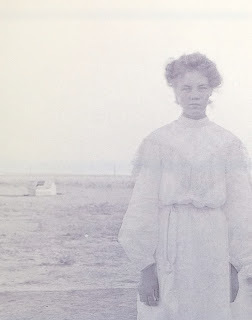 A Sherman County, Kansas, young pioneer woman with her sod house in the background. Can you imagine living and raising a family there? and determination in her eyes? recycled yet again for another generation to enjoy. What inspires you? I'd love to hear it! I find a story like this very inspiring! But I felt so strongly that I wanted to see the quilt you are talking about. Do you have a photo? I don't have a photo! I actually have cut it up into pieces to begin reusing it as jewelry. It is very, very ragged and faded but still beautiful. I will post more about it, along with pictures.